Implantation is the very early stage of pregnancy at which the embryo adheres to the wall of the uterus and begins to form the placenta. At this stage of prenatal development the embryo is a blastocyst. In humans, implantation of a fertilized ovum occurs between 6 to 12 days after ovulation. In preparation for implantation, the blastocyst sheds its outside layer, the zona pellucida, and is replaced by a layer of underlying cells called the trophoblast. The trophoblast will give rise to the placenta after implantation. During implantation, the trophoblast differentiates into two distinct layers: the inner cytotrophoblast, and the outer syncytiotrophoblast. The syncytiotrophoblast then implants the blastocyst into the endometrium by forming finger-like projections into the uterine wall called chorionic villi. endometrium: The mucous membrane that lines the uterus in mammals and in which fertilized eggs are implanted. trophoblast: The membrane of cells that forms the wall of a blastocyst during early pregnancy and provides nutrients to the embryo and later develops into part of the placenta. human chorionic gonadotropin (hCG): In molecular biology, human chorionic gonadotropin (hCG) is a hormone produced during pregnancy that is made by the developing placenta after conception, and later by the placental component. implantation: The embedding of the blastocyst to the uterine wall. Implantation is the very early stage of pregnancy during which the embryo embeds into the wall of the uterus. At this stage of prenatal development, the embryo is a blastocyst. It is by this adhesion that the fetus receives oxygen and nutrients from the mother to be able to grow. In humans, implantation of a blastocyst occurs between 6 to 12 days after ovulation. In preparation for implantation, the blastocyst sheds its outside layer, the zona pellucida, which binds sperm during fertilization. The zona pellucida degenerates and decomposes, and is replaced by a layer of underlying cells called the trophoblast. The trophoblast will give rise to the placenta after implantation. During implantation, the trophoblast differentiates into two distinct layers: the inner cytotrophoblast, and the outer syncytiotrophoblast. Chorionic villi: During implantation, extensions of the trophoblast, the syncytiotrophoblasts, embed within the endometrium and form chorionic villi. The syncytiotrophoblast then implants the blastocyst into the endometrium of the uterus by forming finger-like projections into the uterine wall called chorionic villi. The chorionic villi grow outwards until they come into contact with the maternal blood supply. The chorionic villi will be the border between maternal and fetal blood during the pregnancy, and the location of gas and nutrient exchange between the fetus and the mother. 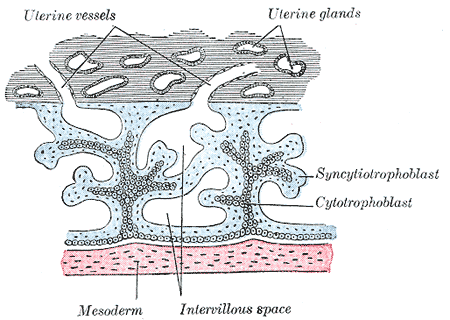 The creation of chorionic villi is assisted by hydrolytic enzymes that erode the uterine epithelium. The syncytiotrophoblast also produces human chorionic gonadotropin (hCG), a hormone that notifies the mother’s body that she is pregnant and prevents menstruation by sustaining the function of the progesterone-producing corpus luteum within the ovary. Human chorionic gonadotropin is the hormone that is detected by pregnancy tests, as it is found in the maternal bloodstream and urine.